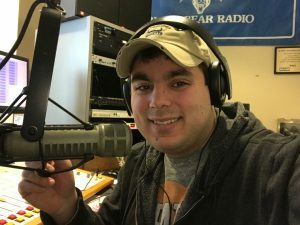 Hi, I am Jonny….I started working in radio in Midcoast Maine at 103.3 FM (WMCM) when I was in high school. In college I moved to Bangor and got a job at 97.1 FM (WBFB) playing hit music, and later covering sports. For a few years I hosted afternoons on 99.1 FM (WBFE) in Downeast Maine. Now I am on the air on all three stations every weekday from 10am to 2pm! I’ve always loved country music, and enjoy playing the best new country everyday on the Bear. I live with my wife Kim, and our two kids Silas and Josie. They told me to put up a few random facts about myself………(in no order) I love Hockey, Moxie (the best soda ever), Fender Telecasters (I only have one…but could use a few more), The Red Sox, Banana Bread, and Backgammon.